So to answer everyone's questions from my last post, no I have not caught the rat. I haven't seen it in the house since Wednesday night, but I could still hear them scrabbling about in the walls last night, and consequently I have not slept at all the past two nights except for a couple of hours once it started to get light. I AM A ZOMBIE. And of course, because I rent I have had the added drama of trying to get something done about it. I rang the agent 9am on the dot yesterday morning and she said she'd get back to me. She didn't, so I rang at 9am again this morning and left a message for her. Again she didn't get back to me. Rang a 3rd time at 3pm and she told me that the landlady had pointed out it was my responsibility. I was super pissed because a) when was she planning to tell me that, and b) why the hell is it my responsibility? What kind of stupid law is that? I rang the pest control people and while I was talking to the guy I mentioned the possum in the roof, and he said that would make it more expensive because they had to set special bait traps the possum couldn't get into. However, he said if I wanted the possum removed as well, then the landlady had to pay for it and they would clear the rats at the same time. So, sorry Kevin - your right to squat in my roof is trumped by my right to have a decent sleep without the crippling, phobic fear that I will wake up and find a rat chewing on my hair. (I did check first to make sure they weren't going to kill the possum, and they don't.) So I rang the agent back again, who rang the landlady and got the go ahead (grudgingly, I'll bet). 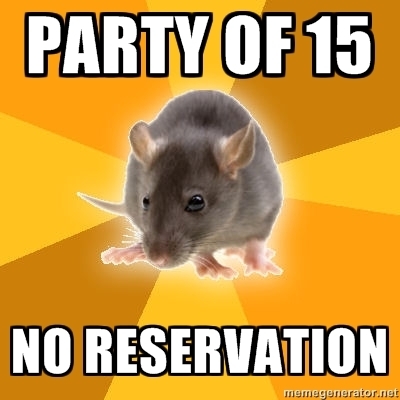 The bad news is that the pest control people can't come until Tuesday and it's a several stage process. They have to get the possum out first, then come back and lay the rat traps. So it looks like it will be the end of next week at least before I can sleep at night again. Perhaps we've got both too? I'm learning a lot from the escapade Dee. So much harder when you're renting too. Booouuurns :( makes me think we need something done about the vermin here too urgh, I've definitely heard something in our walls/roof. Yeah, that scratching sound in the house is freaky as hell! We had raccoons living in our chimney once and it sounded as if they were right in the house, the lot of them were so freaking loud. And one day I came home to find all five members of my family yelling and shouting with brooms and all sorts of utensils in their hands, crowded around the living room corner. They frightened a poor tiny mouse to death with their screaming rather than by actually getting to it. Poor thing.